Matthew Charles Weiss is a proud member of The Delian Society which is an international community of composers, performers, scholars, recording engineers, music publishers, and amateurs dedicated to the revitalization of the great tonal traditions in art music. Matt is a strong supporter of the Suzuki Method, especially for young violinists wishing to develop all the skills they need to become successful musicians, students, and well-rounded human beings. Dr. Suzuki’s method is based on the development of a deep love of classical music from a very early age. Children exposed to the Suzuki Method live and breathe great music absorbing it like a sponge in the same way that they learn their original spoken language or “Mother Tongue”. 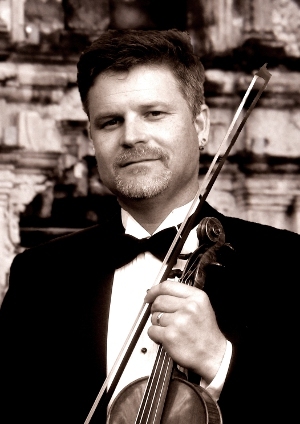 Along with being a fine composer, Matt is also a solo, orchestral, and chamber violinist of the highest caliber. He began playing the violin at age 4 and composed his first classical composition in his teens while studying music theory at the Northwest School of the Arts, Humanities, and Environment. Later, he spent 2 years at the Evergreen State College where he studied Western Literature and Computer Science. Following this he transferred to the University of Washington School of Music and in 1991 earned a degree in Violin Performance while studying with the internationally renowned soliost, teacher, orchestral and chamber musician Steven Staryk. He previously studied with violinists Walter Schwede, Gwen Thompson, Mara Dvonch, Emanuel Zetlin, Denes Zsigmondy, Mari Nakamura, and Dr. Shinichi Suzuki, founder of the Suzuki Method. Matt studied music theory and composition with Ken Benshoof, Diane Thome, and James Beale at the University of Washington and privately with William McGreal and James William Clarke who also coaches him in piano, voice, and conducting. Matt is the concertmaster, president, and co-founder of the Octava Chamber Orchestra under the baton of Maestro Johan Louwersheimer, concertmaster of the Seattle Bach Cantata Society, first violinist of the one and only Trio Con Brio®, assistant concertmaster of the Lake Union Civic Orchestra directed by Maestro Christophe Chagnard, and has been the concertmaster of a number of orchestras including the Seattle Philharmonic Orchestra with Maestro Nico Snell, the University of Washington Symphony Orchestra with Maestro Peter Erös, the world-renowned Seattle Youth Symphony Orchestra with Maestro Vilem Sokol, and the Thalia Youth Symphony with Maestra Frances Walton. Matt performed frequently in recital and in live radio broadcasts hosted by George Shangrow on Classical King FM 98.1 with pianist Joel Salsman. The repertoire included works of the great composers such as Mozart, Bach, Beethoven, etc. as well as contemporary Northwest composers such as Alan Hovhaness, John Verrall, James Beale, Gloria Swisher, and others. Matt also does session work in the Seattle area for pop music, etc. His biggest claim to fame in this arena is a recording session with the well-known 90s grunge band Alice in Chains for their top-selling album “Jar of Flies”. He recorded violin tracks for “Whale & Wasp” and “I Stay Away” which peaked at number ten on the Billboard Mainstream Rock Tracks chart, and was nominated for the Grammy Award for Best Hard Rock Performance in 1995. Matt has a keen interest in the classical and folk music of India studying tabla from tabla virtuouso Vishal Nagar of the Delhi gharana, and appeared in recital with Vishal and Ujwal Nagar, performing a violin lehra in Charukeshi raga as Vishal and Ujwal presented a stunning tabla duet. Matt also is a great fan of classic Star Trek and other sci-fi and has been seen dressed up as Captain Kirk, Mr. Spock, the young Obi-Wan Kenobi, and other characters, most notably in the YouTube sensation “Charlie Matthews and the Cosmic Nebula Band” starring himself and his children Adam, Charlotte, and Kenny.